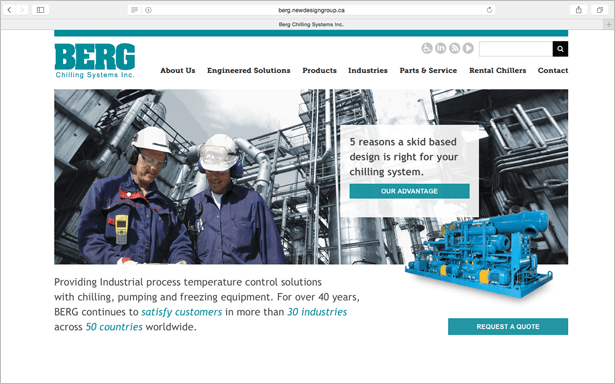 Berg Chilling Systems - A Customised Website for Improved Conversions | New Design Group Inc.
Berg Chilling Systems Inc., based in Toronto, was founded over 40 years ago and has grown to be a designer and manufacturer of state-of-the-art industrial temperature control equipment in demand by businesses around the world. 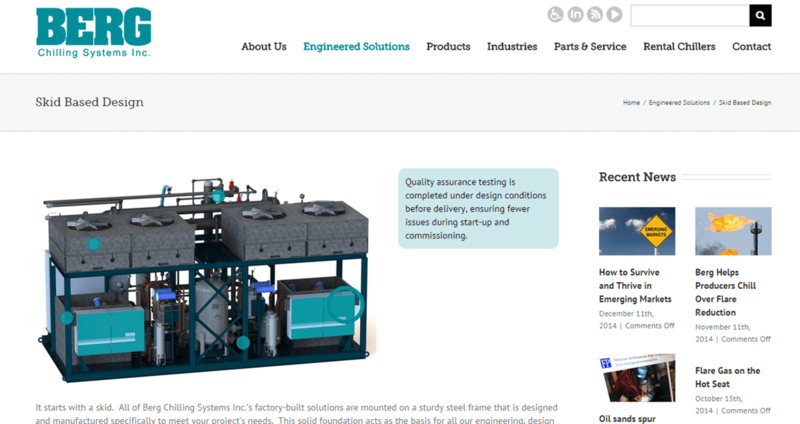 The company prides itself on providing innovative-engineered solutions to clients’ needs which improve energy and production efficiency using its proprietary Parametric Engineering Program coupled with an exceptionally experienced team. When Berg approached New Design Group, they were seeking a complete redesign of their existing website which was looking outdated. In short the website was falling short of selling the company brand effectively. Initially New Design Group interviewed the stakeholders to gain a better understand of the website’s objectives and the functionality required. It soon became apparent that Berg wanted more pre-qualified leads that would seamlessly flow to the appropriate sales department, reducing the number of enquiries from people who would never realistically become customers. 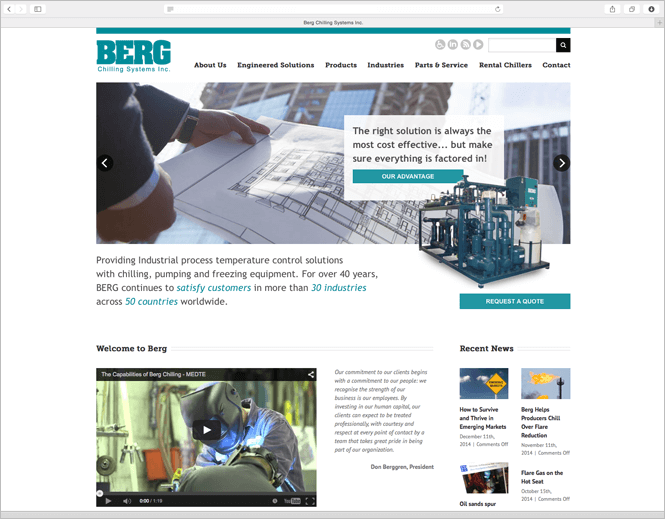 Berg also needed a website which was clear about which industries they served and one which provided simple layouts to help clients find the products they needed. In short the website needed to be streamlined and to move potential clients effortlessly through the sales funnel – from browsing products, comparing products and finally requesting a specific quote. Having completed their research phase, New Design Group were able to create a modernised WordPress website which improved conversions. A fundamental improvement to the website was to allow the visitor to search by type of industry or by type of product. In both instances, the ‘dropdown’ list was designed as a couldn’t-be-clearer grid showing exactly what Berg offers. Equipment images were used in the website where the viewer is able to hover their mouse over circled areas to learn more. This is a great way to reduce text heavy pages and to encourage visitor interaction with the website – all-in-all a modern flair to a modern website. To allow clients to create a shortlist of preferred products which they could revisit, and to also request a quote or rental without difficulty, New Design Group took an e-commerce module and modified it creatively. Due to the wide range of products on offer, a ‘bookmarking’ function was incorporated into the website in place of an ‘Add to Cart’ function. If a client browses a detailed product page and likes what they see, they can easily ‘bookmark’ the page and then later browse their bookmarks. 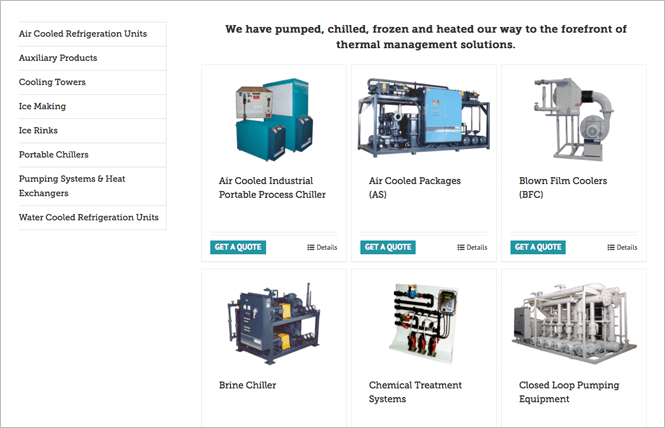 Whether a client wants a quote for purchasing a chilling system, or a rate for a rental chiller, the website is designed to make things as easy as possible. The Get a Quote / Get a Rate buttons are clearly shown next to each individual product in place of an e-commerce ‘Buy Now’ function. Whilst every business wants to hear from prospective customers, a savvy company wants to focus on leads that are seriously interested in purchasing or renting. 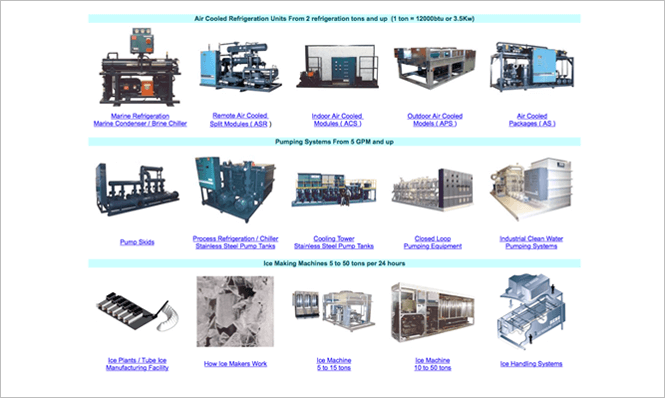 In the case of Berg, the purchase or renting of industrial scale chilling equipment is only in the realm of those in the right business and with the right budget. Berg therefore took the strategic decision to use their website wisely – and to pre-qualify their leads at the form submission stage. Furthermore each form is directed to the specific sales department rather than to a generic info@ type of email which could delay response time. To ensure that the imagery on the new Berg website reflected the high quality of products and services on offer, New Design Group recommended a specific photoshoot. Berg embraced the idea which resulted in a 2 day photoshoot with an Art Director and photographer. 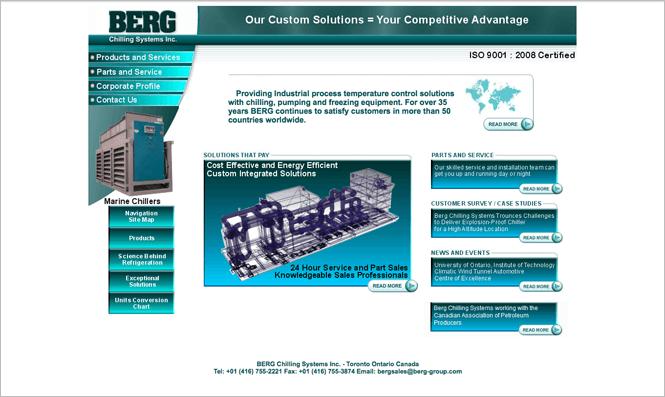 Consequently the new website features high quality images of Berg, its products and its staff. Additionally pre-existing videos that were on the Berg YouTube Channel were embedded into the website to showcase to viewers the engineering solutions on offer. Berg required a modernised website that showcased its products, its exceptional service and ranked well on Google searches. And importantly it wanted to increase the number of pre-qualified leads submitted by its request a quote or request a rate functionality.